The sun hadn’t yet risen above the mountains when I met this hungry black-tailed jackrabbit. 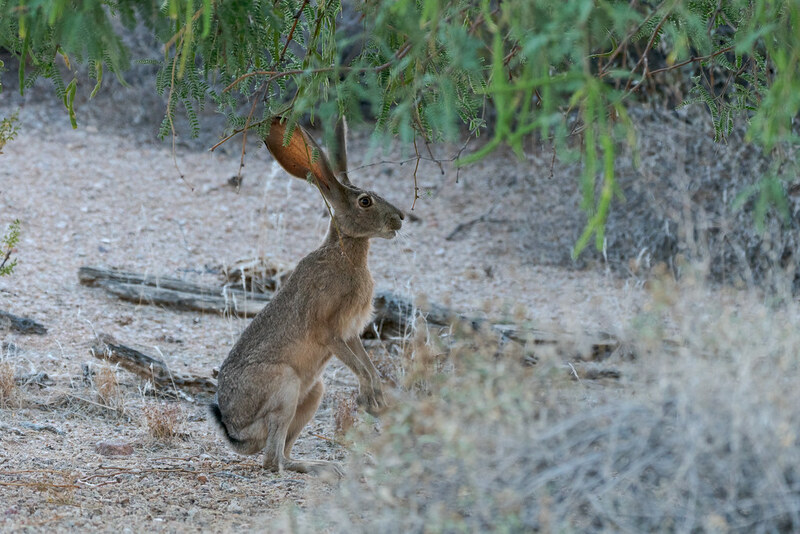 They share their habitat with the more numerous desert cottontail but the larger jackrabbit with its long legs can get to food that the cottontail cannot, reminding me of a giraffe using its long neck to eat leaves high in the trees. I hadn’t seen a rabbit spend so much time up on its hind legs before, this desert is full of surprises. 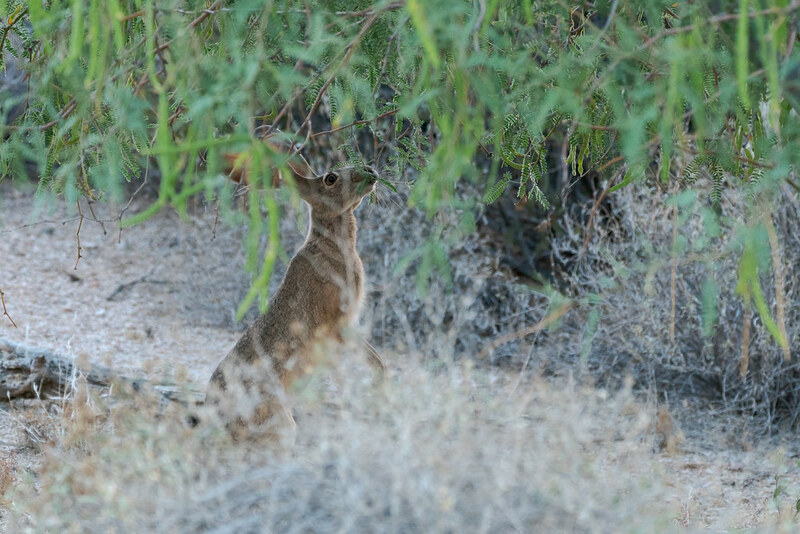 Both the black-tailed jackrabbit and the desert cottontail are named for their tails. 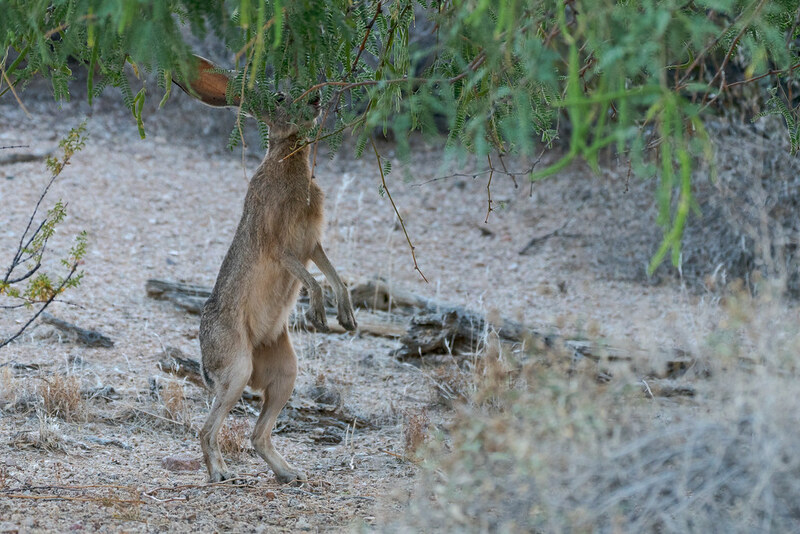 The cottontail has a round white tail like a giant cotton ball, while the black-tailed jackrabbit has a tail that is black on top, as you can see as it sits up off the ground as it eats leaves it has pulled from the tree. It’s hard to tell from these pictures but the tops of their ears have black tips as well. Apparently they can run quite fast and jump in long leaps but the three times I’ve seen them they’ve casually hopped through the desert. 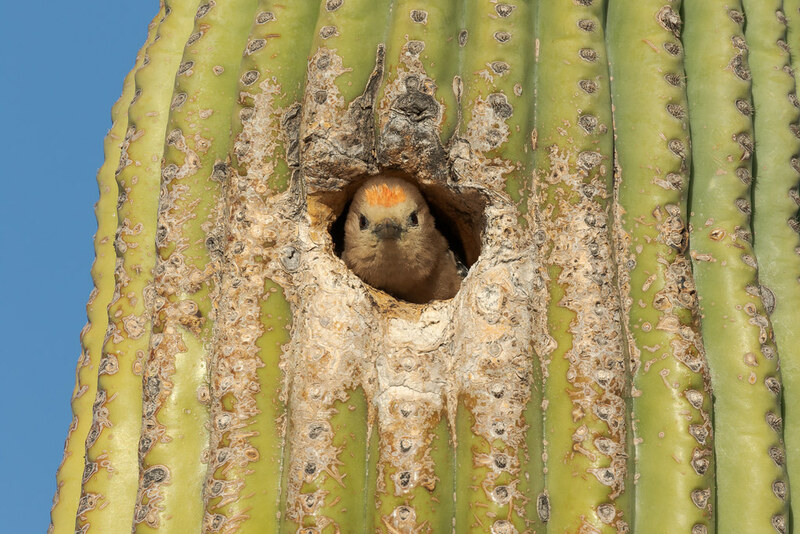 The old saguaros are warriors. It’s remarkable they can survive in this climate at all, astounding they can do it while sustaining heavy damage. 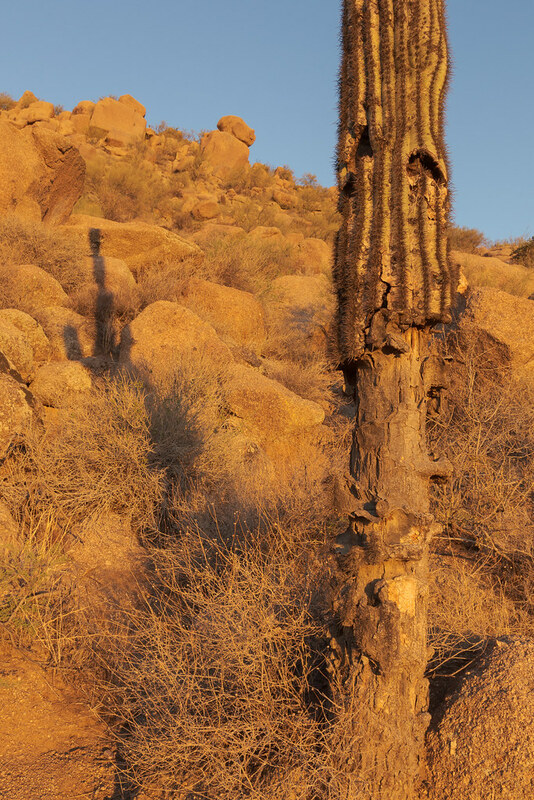 I don’t know how recent the damage to the base of this cactus is but as you can tell from its long shadow it is still growing at a great height with a couple of the iconic arms near the top (the arms usually don’t start growing for 50 to 100 years, depending on the amount of rain). I saw one saguaro that had fallen over and little remained except a short stump, but enough of the internal plumbing and root system survived that a new arm was growing. I hope they prove a metaphor for my country, for all the damage it has sustained and with more to come, I hope the promise of America overcomes its reality. 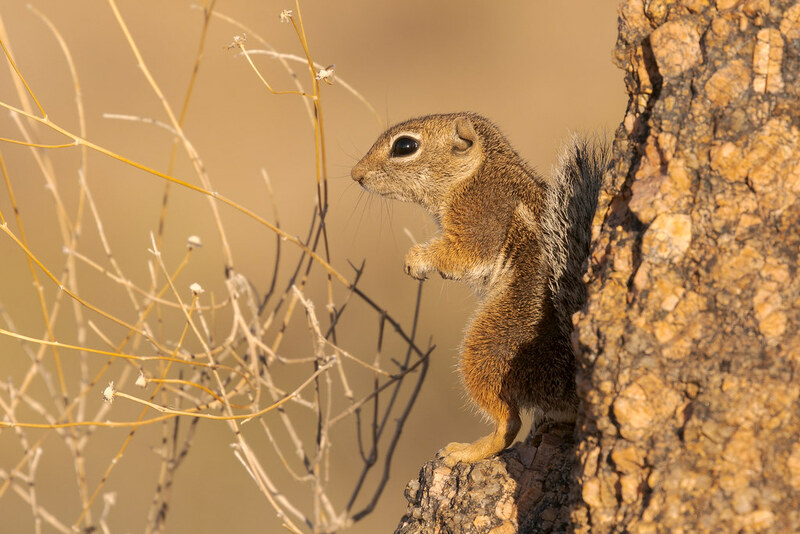 I arrived early on the Vaquero Trail to look for the antelope squirrels but as I approached from below I could see none were out on the rocks. I took a breakfast break and while drinking some water I noticed what reminded me of rhubarb back in the rocks. I hadn’t seen any plant like that in the desert but then I still have so much to learn. In case it was a discarded rubber gasket I went in for a closer look in case it was trash I should take with me, and that’s when I realized my rhubarb had scales. 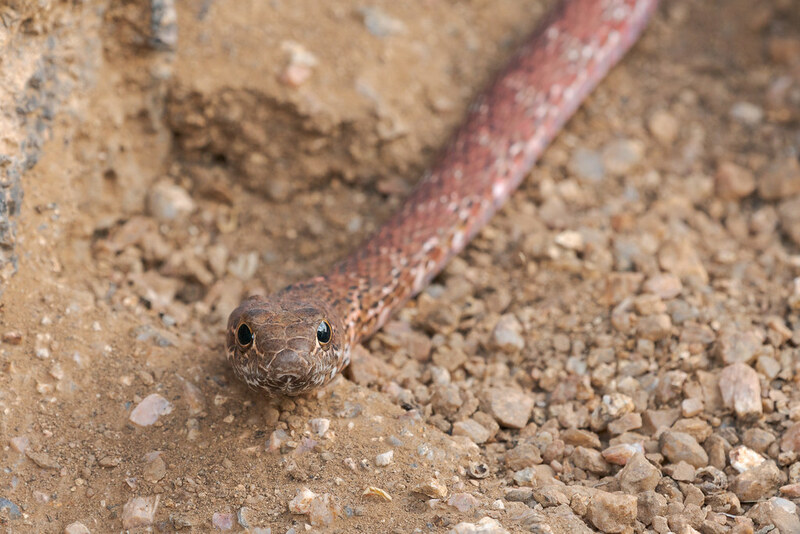 I believe this is a coachwhip (of the red racer variety) and I have to say I was rather stunned to see it, I had no idea such a lovely creature existed! 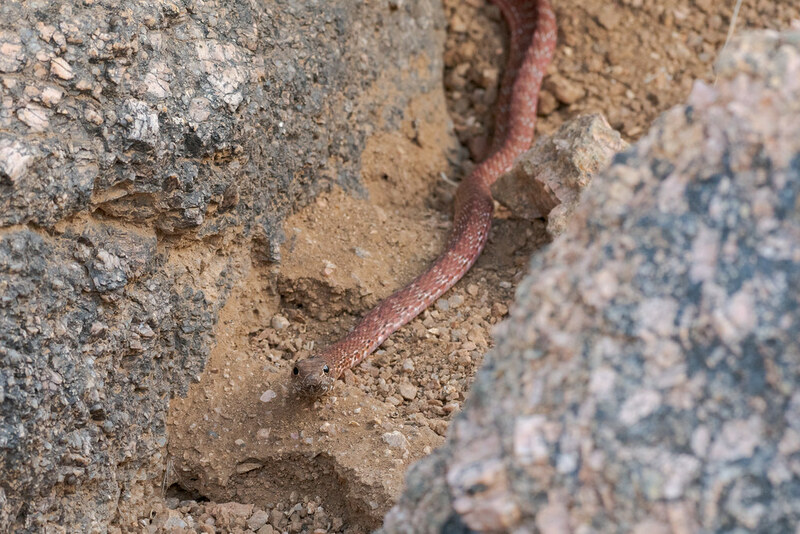 While not venomous it is a threat to many of the small animals of the desert and I hope the bulge I saw in its middle wasn’t one of my squirrels! 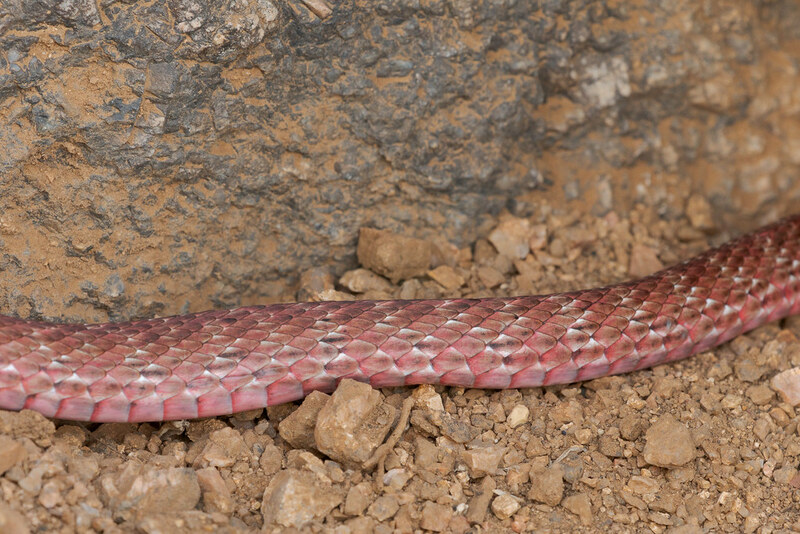 Since it wasn’t coiled up and resting I took some pictures and then backed off in case it wanted to move, it didn’t while I finished my water and food break but after a mountain bike came whizzing past I looked up and the snake was gone. Moving to Arizona I hoped to see a Gila monster though I knew they are rarely seen in the desert. Moving from Oregon I was sad to leave behind the rain for it is also rarely seen in the desert. Sometimes you get lucky. Up before sunrise I drove to the preserve as rain fell from darkened skies. I wondered if the trails would be crowded with people just as excited about hiking in the wet (they weren’t), even as I feared I wouldn’t see many reptiles (I didn’t, I only saw two all morning). But what two! 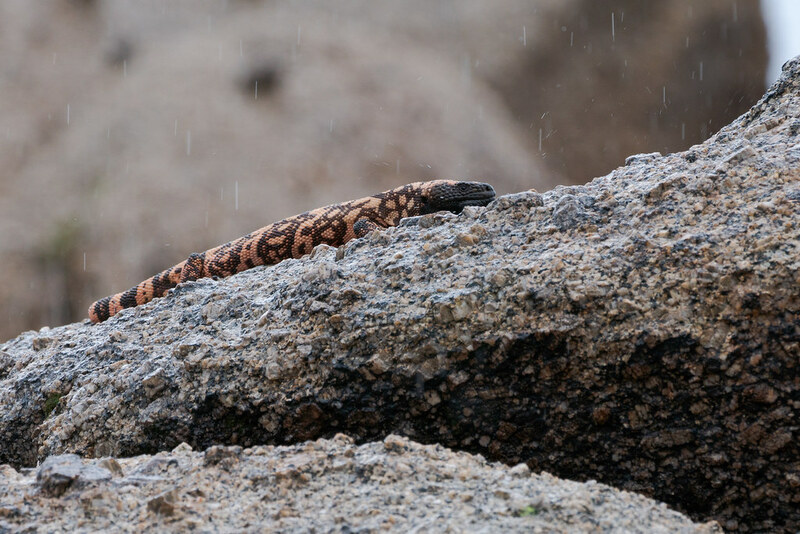 After getting to watch a rattlesnake in the rain at my leisure, after circling Cholla Mountain I approached the spot I had seen a Gila monster before and thought it would be funny if there was a glitch in the matrix and I saw one there again. I didn’t. I had to take a few steps further. As I scanned the rocks above me as the rain pounded down, there it was, my monster. Unlike with the snake my time with the Gila monster was altogether too brief. I had to move quickly but I was able to get some pictures of two of my loves together, this magnificent lizard and this glorious rain. It was raining in the desert. Even better, I was out in it. So it was already a glorious morning when I found a jewel beside the trail, a diamond if a smaller one. I put my new Sony telephoto lens to good use although I hadn’t expected to expose it to the rain quite so early in its life as it was only my third time hiking with it. 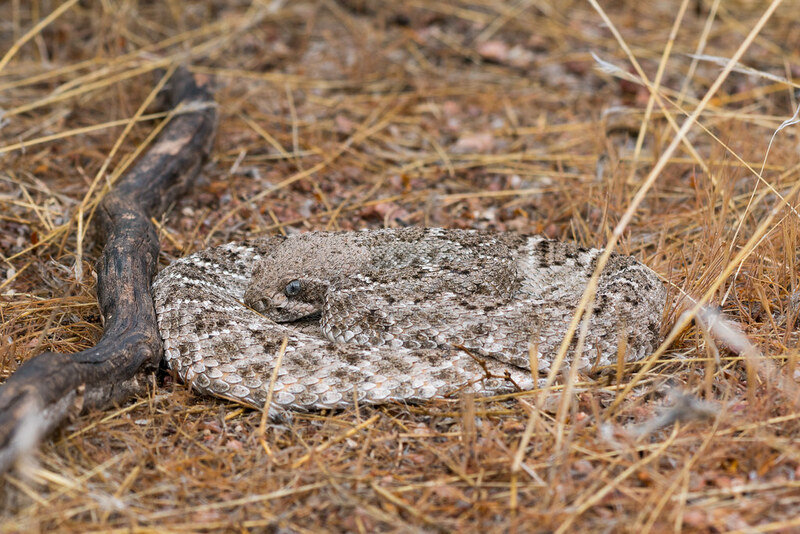 The rattlesnake was comfortable with my presence as the rain poured down and I wasn’t about to let such an opportunity pass me by, new lens or not. My preference when shooting wildlife is for them to be aware of me and to feel in control of the encounter, usually to minimize the stress to them but in this case also to minimize the stress to me. 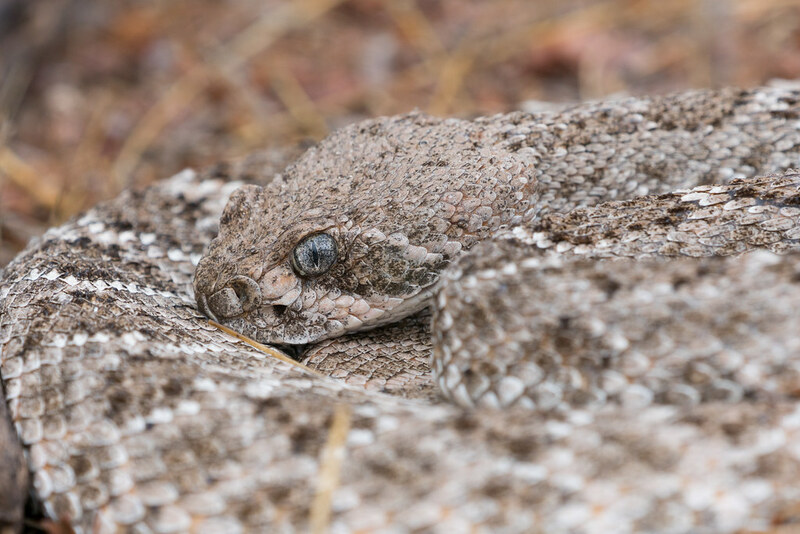 Beautiful as they are western diamondbacks are both our largest and most common rattlesnake and worthy of respect. As the rain intensified I noticed it calmly started sweeping its head across its coiled body. At first I thought it might be a sign it wanted to move so I backed even further off but the behavior continued, a slow graceful sweep of its head across its body. I resumed looking through the telephoto lens and realized its mouth was moving, like it was swallowing, and I wondered if it was drinking raindrops from its scales? Or cleaning them? In the close-up shot you can see water drops on its head and even its eyes. Near the front of its head you can see one of its nostrils, and in between and below the nostril and eyes you can see the heat-sensing pit that allows them to hunt at night. After taking a break for water and food I continued on my way. May all our encounters be so peaceful little one, I pray we never meet in anger.